Does the shape of this bottle look familiar? Yep, it's exactly the same as last week's Historic Lynchburg sauce. There are a lot of similar design elements on the label, too. As similar as they are, I couldn't confirm that this sauce is made by the same company. I like Hank Jr. well enough. He's written a boatload of great country songs through the years, perhaps none better than "All My Rowdy Friends Are Coming Over Tonight," which sometimes gets glossed over as "the Monday Night Football Song." But it's great apart from that. "Do you wanna draaaaank" is classic, and you've gotta love the barbecue reference ("we cooked a pig in the ground"). 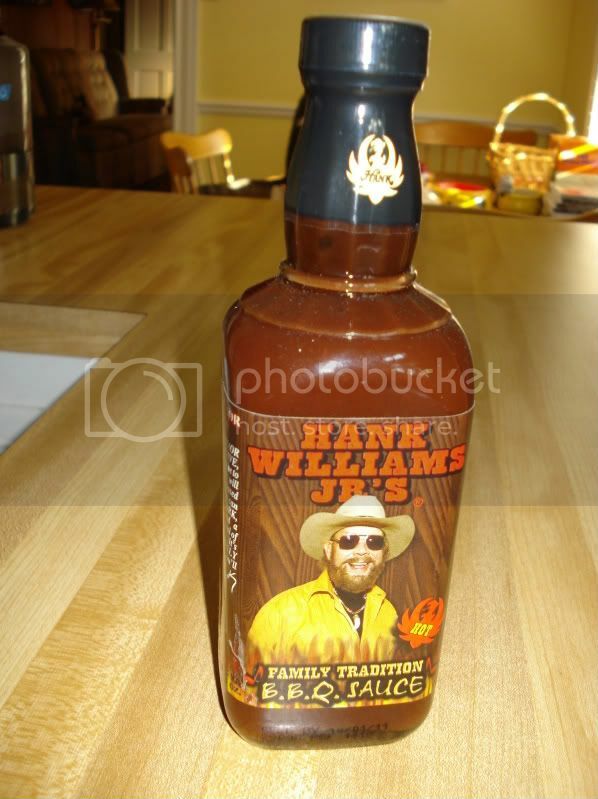 So I'm down with Ol' Hank having his own barbecue sauce. The sauce is a unique one. This is perhaps the most savory barbecue sauce that I have tasted in these reports. The savory is courtesy of a walloping dose of worcestershire sauce. There is also a little bit of sweetness and a little bit of tanginess, and it finishes with more than a little heat (it is labeled as "hot"). But overall, salty and savory rule the roost. I'm a big fan of Hank so that sauce looks great! Didn't know he had something out like that. Definitely will go good with some beers, BBQ chicken and the Best of Hank Williams Jr!